United States and South Korea astronomers have made the first high resolution radio telescope observations of the molecular clouds within a massive star formation region in the outer Milky Way. "This region is behind a nearby cloud of dust and gas," said Charles Kerton, a professor of physics and astronomy at Iowa State University and a study group member. "The cloud is blocking the light and so we have to use infrared or radio observations to study it." The Milky Way region is called CTB 102. It is about 14,000 light years from Earth. It is classified as an HII region, meaning it contains clouds of ionized charged hydrogen atoms. And because of its distance from the earth and dust and gas in between, it has been difficult to study. And so, "this region has been very poorly depicted," says Kerton. The astronomers describe their first draft of a new, higher resolution map of the region in a paper recently approved for publication in the Astrophysical Journal . Lead authors are Sung-ju Kang, a staff researcher at the Korea Astronomy and Space Science Institute and a former doctoral student at Iowa State University; and Brandon Marshall, a former Iowa State Bachelor's degree who has approved a faculty position at the University of Nebraska at Kearney. Other co-authors are Kerton and Youngsik Kim, Minho Choi and Miju Kang, the entire Korea Astronomy and the Space Science Institute. Kim is also with the Daejeon Observatory in South Korea. Kerton said astronomers used a newly-established radio telescope at the Taeduk Radio Astronomy Observatory in South Korea to take high-resolution carbon monoxide observations of the galactic region's molecular clouds. "It tells the mass and structure of the material in the interstellar medium there," says Kerton. The astronomers also compared their radio observations with existing infrared data from Infrared Survey Explorer and Two Micron All Sky Survey. 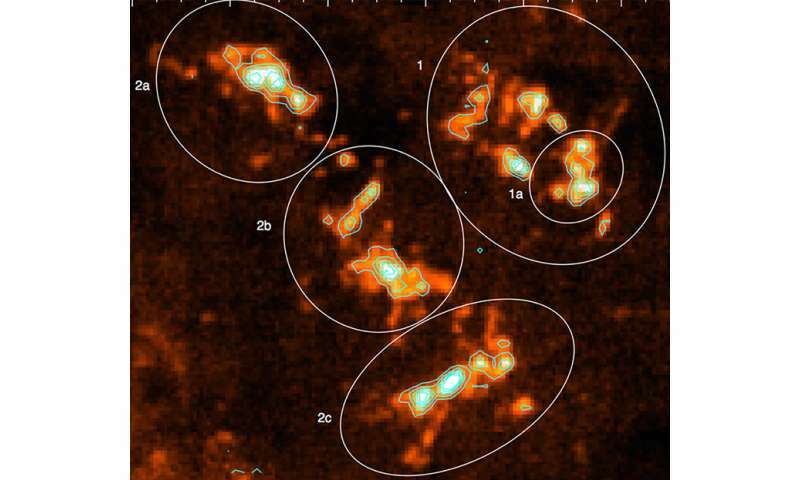 The infrared data allowed them to classify young stars formed within the molecular cloud of the region. The data provides three major observations, reports the astronomers in their paper. 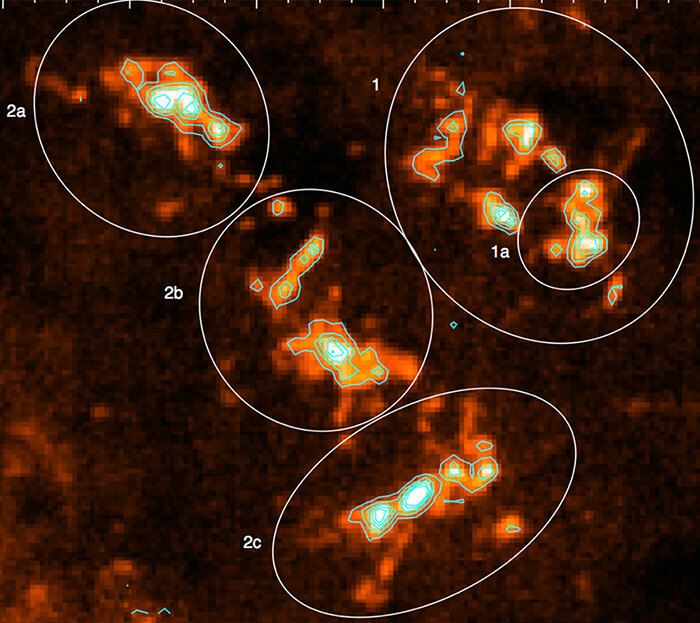 First, the astronomers used radio data to describe the physical structure and characteristics of the region's newly formed molecular clouds – they are quite large, about 180 light-years over with a mass corresponding to about 100,000 masses of our sun. Then they used infrared data to determine the young star-shaped contents of the clouds. Finally, they combined the two data streams to study the effectiveness of the star formation in the galactic region. They report that the star formation efficiency of the entire CTB 102 region is about 5% to 10%, which is similar to other giant molecular clouds within the galaxy. But they found a subregion of the clouds with a star formation efficiency of 17% to 37% (depending on how the subregion mass is calculated). It is much higher than would be expected for a sub-region of its size. They speculate the subregion is the site of a massive cluster of young, evolving stars embedded in molecular clouds. Why are all the star formations in that subregion? Kerton says it's a matter for further study. Perhaps he said, there is something special about the interstellar material in the sub-region that is adjacent to the massive HII region. "This is our first look at all this," said Kerton. "The older data was just a few points, a few pixels. We couldn't isolate this relatively small galaxy area." The study's high-resolution observations, Kerton said, "is also a demonstration that the telescope is ideal for studying similar regions in our galaxy – there are many other potential goals."